As we settle back into school and begin to get our Learning Support, Resource and P.E. time slots, most of us (well me anyway!) are probably in the midst of deciding upon a more permanent timetable for the year ahead. 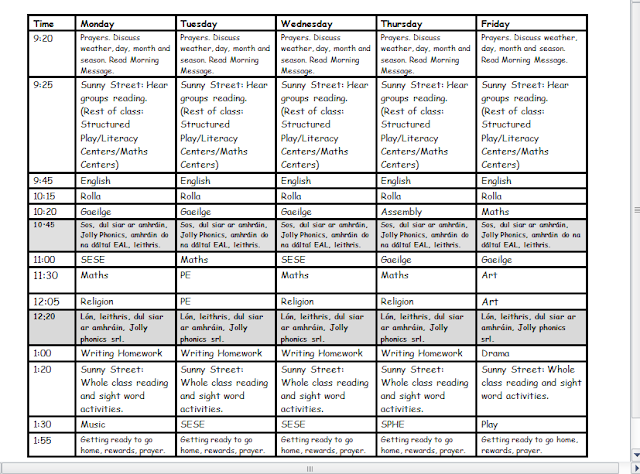 I have had several requests to show you a sample timetable that I found worked for me. Hopefully this will be particularly useful to those of you doing your Probationary year or starting with Infants for the first time! Don't forget that this is only a rough guide - every class is different and what works for one teacher may not suit another. It is also important to remember that timetables are always changing throughout the year and as you learn more about your class you may revise it a few times during the year (I would consider possibly moving maths to the morning slot for some classes for example). 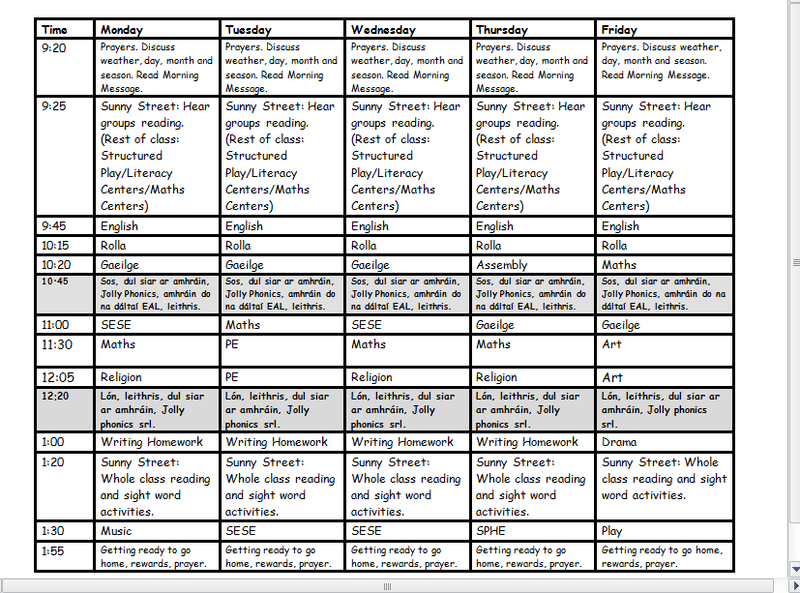 You can download the timetable here if you would like to edit it. Thank you, it's great to see someone else's!! Hi I've got twin boys who started senior infants this month. And they've begun bringing their reading books home. The teacher mentioned is it ok to put them into different reading groups. Which I agreed to. However I'm a lb it concerned as one of their books says Level 1 and the other boy's says level 2. Both are extremely bright boys. Their reports from Junior infants are great. Sorry ran out of space. Their friends mom said her son is in level 3 and my boys are better at reading than her son. She looked after the boys for me one afternoon. So I'm confused about all of this.